Obesity, diabetes, cancer, cardiovascular disease are strongly related to dietary choices. 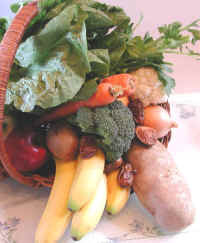 In turn, dietary choices are influenced by government policies that affect the availability and cost of food. This report examines these health problems and policy factors that influence them. As Americans filed their taxes in April, PCRM launched a new campaign against the government's spending of billions of those taxpayer dollars on subsidies that support the production of unhealthy meat and dairy products. Americans are suffering from a high prevalence of obesity, cardiovascular disease, cancer, diabetes, and hypertension. Although these conditions are largely preventable, they continue to harm millions of Americans and cause a mounting financial burden through health care costs. 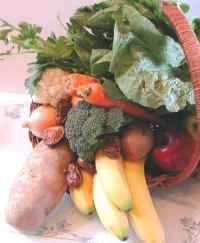 Ten years ago, the Healthy People 2010 plan aimed to reduce the toll of obesity by 2010. At the time it was drafted, one in four Americans was obese.1 As the years went by, it became clear that this goal would not be met. On the contrary, obesity prevalence in 2010 had climbed to one in three. During the same interval, diabetes prevalence has increased as well, and the Centers for Disease Control and Prevention forecast that this worsening trend will continue for the foreseeable future. Cardiovascular disease and cancer remain the No. 1 and No. 2 killers of Americans. Each of these conditions is strongly related to dietary choices. 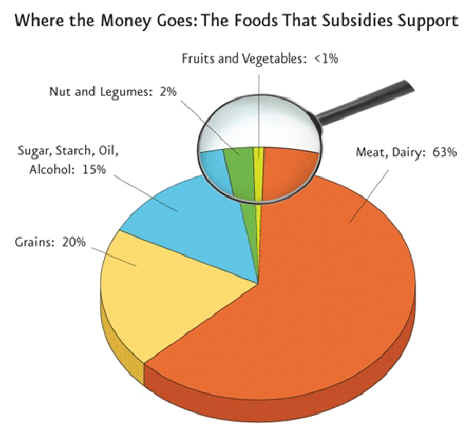 In turn, dietary choices are influenced by government policies that affect the availability and cost of food. This report examines these health problems and policy factors that influence them.